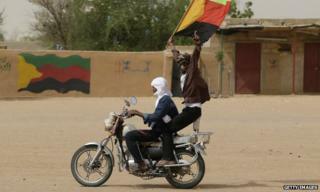 Mali's government and Tuareg rebels have exchanged prisoners in a goodwill gesture on the eve of peace talks. The army said 45 Malian soldiers held by the rebels in the north of the country arrived at Bamako airport. They were replaced on the plane by 41 Tuaregs, who had been held prisoner in the capital. The move comes a day before the peace talks due to open in Algeria's capital Algiers. The two sides agreed a ceasefire in May. However, there is not much optimism for any quick progress at Wednesday's gathering, the BBC Alex Duval Smith in Bamako reports. Rebel groups - including the National Movement for the Liberation of Azawad (MNLA) - have gained control of much of northern Mali in recent months. In 2012, a Tuareg rebellion in northern Mali triggered a military coup in Bamako and an Islamist takeover of the north. Civilian rule was re-established in 2013, but Islamist and separatist forces remain active in some areas. The government has accused the Tuaregs of being backed by al-Qaeda militants.